Jules kindly let me join the Bread Baking monthly challenges at Fresh from the Oven and whilst I wasnt able to join in with last months challenge I have managed to bake this months Fresh Tin Loaf… I’m just a day late in blogging about it. The bread the loaf has produced is certainly not my best, but does have potential – I was multi-tasking when making it and I may have used not-very-fine-sea-salt as the fine sea salt had been thrown away last week when we had a soy sauce disaster in the cupboard! But that aside, the bread tastes delicous, makes crispy toast and a lovely cheese and onion sandwich. The kneading technique for this loaf was devised by Dan Lepard, who, after working full time in commercial kitchens came to realise there wasn’t time for full 10 minute knead of all the different bread batches. He switched to short kneads spaced out and found it works just as well. I have to say I was very surprised when the loaf actually worked as I seemed to nearly pour the dough into the tin… that may also explain its slightly odd shape! 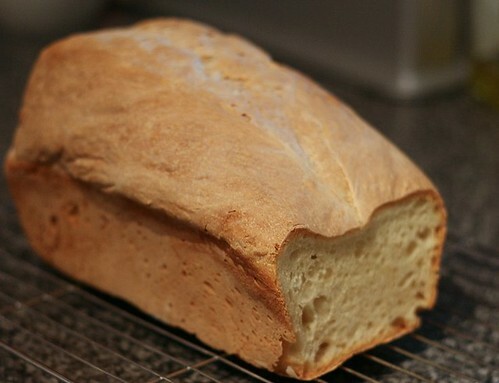 Anyway, it is a delicious loaf and one I’d make again. You must use oil not flour on the kneading surface and your hands. Something like vegetable oil is good. * Once you have soft sticky dough leave it covered in the bowl for 10 minutes. * Now oil your kneading surface and hands and tip the dough out. * Knead for about 12 seconds by folding in the edges to the centre, a bit like shaping a round loaf, rotate the dough as you go. * Flip the dough over, leave it on the surface and cover with a cloth. Wash out the bowl and then oil it lightly. Put the dough back in the bowl and cover. * Leave for 10-15 minutes and then do another 12 second knead. You will notice the dough is already less sticky and firmer. * Leave for 20 -30 mins and repeat the fast knead. You are aiming to have kneaded the dough 3 times in the first hour. * Leave covered to rise until at least 50% larger but not more than double in size (kneading once per hour if it takes more than hour to increase in size). * Tip out onto the oil surface and press the air out of the dough using the tips of your fingers so its square-ish in shape. Repeat the fast knead process (or fold in to thirds then rotate through 90, flatten again and fold into 3rds again). * Shape the dough as required for the particular loaf you are making. Put it in a tin, or supported in a floured cloth in a bowl. * Leave to rise until at least 50% larger and preferably almost double in size. * Slash top and bake as per your recipe. 2lb loaf tin greased and floured or lined with baking parchment (no need to line the short ends just oil them). Oven to be pre-heated to its maximum setting (R10/250C) and with a tray of water in the bottom to create steam. Mix the flours and salt together in a bowl. Mix the water and milk together in a separate bowl and whisk in the yeast. Add the liquid to the flour and mix with the fingers of one hand to a soft sticky rough dough. You may need to add a little more liquid do this a teaspoon at a time until you have a soft sticky dough. Follow the kneading instructions above. To shape for a tin loaf, flatten the dough to a square about the same width as your tin. Roll the dough into a cylinder and press the seam firmly, fold under the two short ends and place in the tin seam side down. Allow to rise (covered) to 1 ½ to 2 times volume i.e. to the top of the tin. I usually check again part way through this time and either adjust temperature again or cover the top with foil if it’s brown enough. Also note that with a traditional gas oven (i.e. one without a fan) the top may brown far too quickly on the side near the heat at the initial temperature so you might want to start at a lower setting of R8/9 for the first 10 minutes. Adapt the setting for what you know about your oven and how things usually bake. When it’s cooked turn it out of the tin and allow to cool. Then when it’s cooled cut a big huge doorstop of a slice, toast it and slather with lashing of butter. Yum. 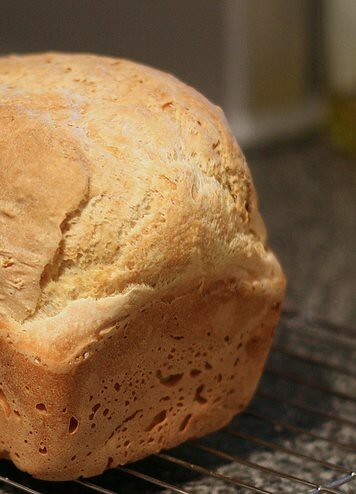 The recipe also works well with a mix of 50:50 wholemeal and white bread flours. You’ll probably need 2-3 tbps extra water.